Hi Eric. I love your 'peasant weapons'. I've been studying the Two Handed Flail myself. You might want to check out my www link to see some videos of stuff I've worked on. Let me know how your weaponizing of a Scythe blade is going. I also intend on mounting a Scythe blade soon. 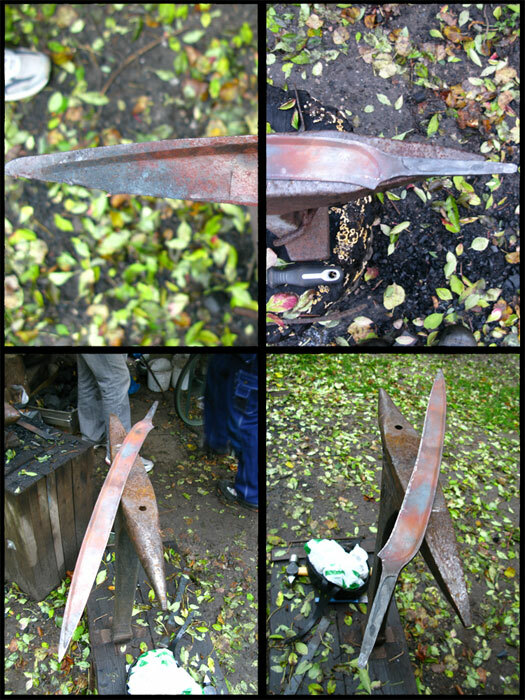 I have some ideas on some cutting methods, based on how the blade is traditionaly made very thin and sharp for mowing. This discussion goes a long way in explaining why the pike became so popular - it was very cheap and very effective. Sometimes the simplest weapons are the best. James, very interesting videos! I posted a link to them on my local fencingclubs forum too and I hope I'll get some responses soon. Your trainingversion does look a bit safer to use than mine. Guess I have to make some practice flails too. I was actually unaware that there were techniques for flail in Mair, thanks a lot for the enlightenment! There.. got some time off today and went to the crummy old forge me and some friends have access to here in town. 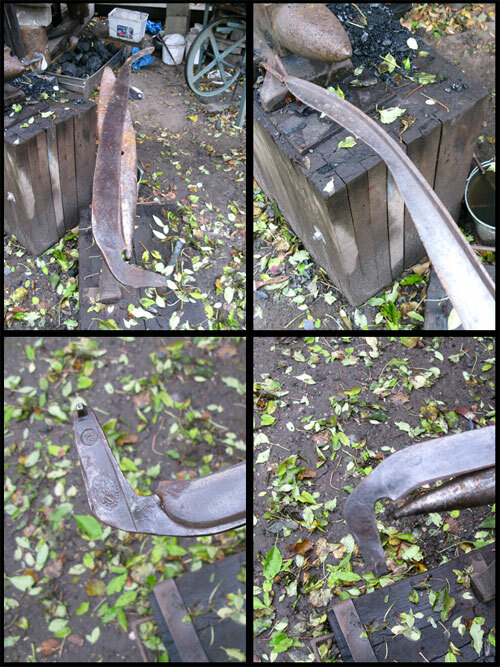 Here asre some pictures of the scythe-project as promised! The weather was not reallt pleasant and it got dark outside way too fast so you will have to excuse the bad pictures. Here is the original scythe I found at the fleamarket/antiquestore for a mere $3. As you can see the tip was very worn out and had been ground down quite a lot. This made me decide it had to come off! 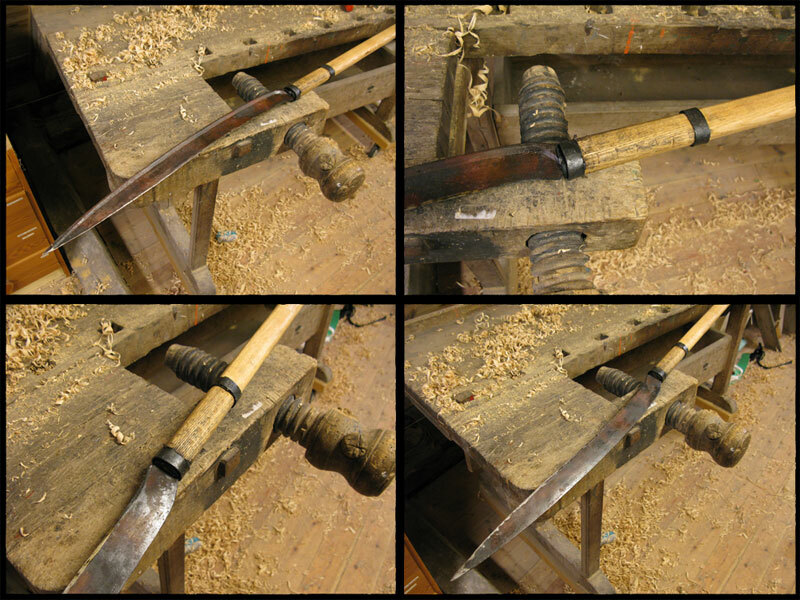 After a few heatings I had straightened out the tang and cut of the top of the scythe I noticed a small crack about 4" trom the point. Well, ti's going to be a simple farmers weapon so I didn't really care more about it. I have another one I might mount in a similar way. And anyways, if it brakes off I can just re-shap the point quite easily. As you wan see here it's finally mounted on the ash pole. I drowe it down a bit to hard the frist time with t he following result of a crack in the top. A removed the blade and then made one extra iron ring and skrunk it on the top. Another heating of the tang and is was finally in place! As you can see the point is a bit off centre but it works very well for thrusting anyways. Nasty stabbing polearm of unknown type, same age. From the armory at Graz, Austria. Hands are mine. Nice pictures Mr. Fulton! 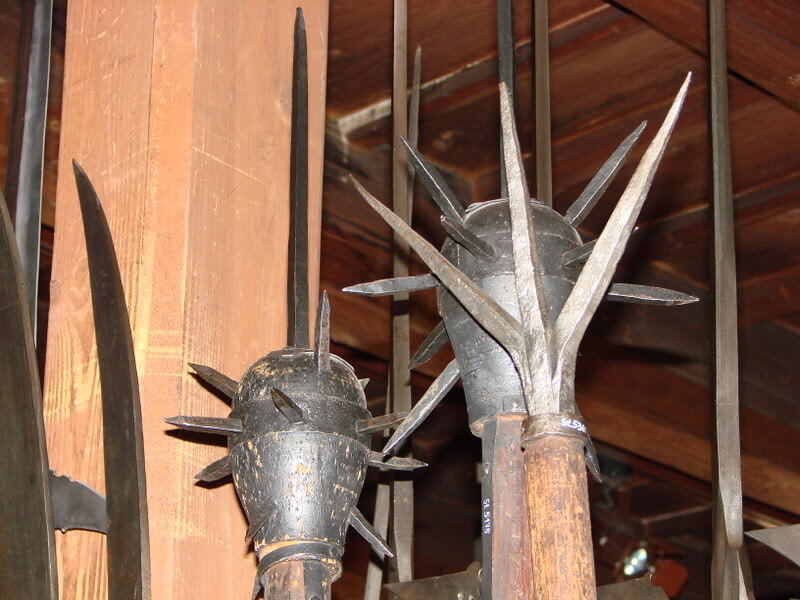 The spiked clubs are very similar to ones I've seen in Sweden too. Guess simplicity does it heh? The flail is very cool too and if I'm not mistaken, that's the same as Manfred Pany made a replica of. The reinforcments with iron strips along the sides makes me belive it was made as a weapon from the start. The flail I made was intended to look as if it was an ordinary agricultural flail that's been modified for war. A bit off topic perhaps but is it hard to get access to the armoury in Graz? It would be awesome to go there, I can tell from the armours in the background! We were at the nearby castle (name escapes me) for an SCA crown tournament, and about 30 of us went to the Armory on the last day. Being that all of us were either SCA fighters, armorers or historian types, we had special permission to handle stuff (with gloves) as shown. Rare to get to go to a museum and the curator says "wanna open up that suit of armor?" Couple of the guys in the group nearly had a collective happy heart attack that day. Being as someone with a love of polearms, able to pick up a 300-400 year old halberd off a rack of 40 of them (with four more racks above/below it) with nothing more than the instruction "Don't drop it" to test the balance, heft and swing......awesome. I have approximately 4 pages of Photobucket pics from the trip, as well as one of the museums in Vienna i hit the week earlier from my 2006 trip there, i may post some. Hmmmmmmmm: So any conclusions or impressions on the handling of the original halberds. Sort of cruel and a tease to mention all the handling without giving details/opinions. Less "one end heavy" than I expected. Rather balanced, similar to a musket with bayonet though I didn't get to swing it around more than a tiny bit (no room). Very solid feel, and I bet it recovered quickly, more so than some axes. It had a smaller axehead, longer spearhead and I believe it was a hammer back, not as "ornamental" as a Vatican Guard's but very, very functional. Some of the armor there had definitely seen action going by scars, dents and scrapes, one had a hole in it, that if the owner was wearing it when it happened, he didn't survive it. Pikes were field weapons and not used for personal protection. I think that the OP was asking more about swords and sword analogs. 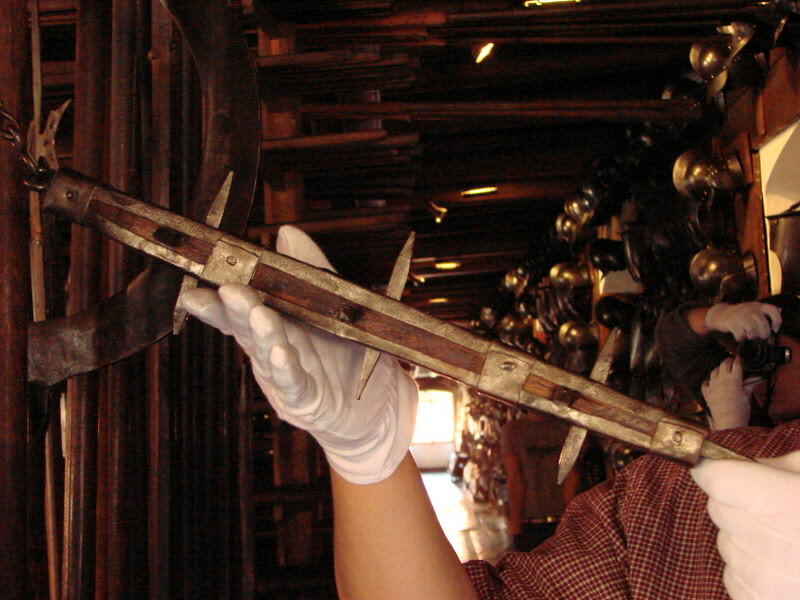 It's likely that seaxes and messers were the European equivalent of the Japanese wakizashi: "What? It's not a sword, just a grown-up knife!"